Play clothes that make life easier. When you care enough to send the very best, on your child, in the cold, send this stuff. Life is precious! And so are your children. As we get larger in size, Key Industries adds features and toughness! Your kids will be warm and secure in these warm Polar King hooded jackets. Soft feeling fabrics that are a lot tougher than it would seem. And, at a discounted price that anyone can afford. 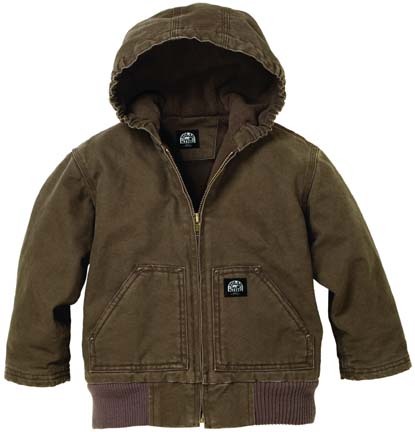 These kids coats are unique, because they feature the same great details that your winter coat has: Bi-swing back for reaching up or forward, a warm hood that works, elastic at the bottom to keep wind from blowing up their back, working pockets that hold rocks, toys, or occasionally gloves. .48 Sapphire Blue, .69 Raspberry Red. 100% mid-weight duck. Brushed Hand. Bonded polyester fiberfill insulation. Fleece body lining. Black taffeta sleeve lining. Recessed dyed-to-match knit storm cuffs and waistband. #5 antique brass front zipper. 3-piece hood with elastic inserts for fit. Bi-swing action back. Inside chest pocket. Triple needle stitching. Two patch pockets. Locker loop.